It can be used for many products, either on its own or combined with other flours. 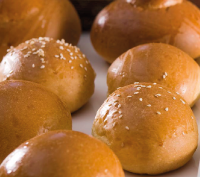 For products that use fortified flours as a base, Deluxe KRAFT creates tougher, more resilient doughs. It can also be successfully combined with other fortified Deluxe flours, when those are stronger than what the product needs. It is suitable for creating fresh and frozen pastry. Pizza, soft crust(kourou) puff pastry, kaiser breads, baguettes etc.